Not French. I’ll get to more of those shortly – these have been haunting the workbench for some time and I finally finished them up last night! Huzzah! They also have Red Baron and Rommel and Staff packs I’d be keen to pick up at some point… and are one of a very few companies that make Great War Italians!? (I think Old Glory also makes a few Italians). From left to right we have; Pte. S. Baldric, Capt. E. Blackadder, and Lt. G. Colthurst St. Barleigh. From left to right we have; Capt. K. Darling, Gen. Melchectt, and Driver “Bob” Parkhurst. 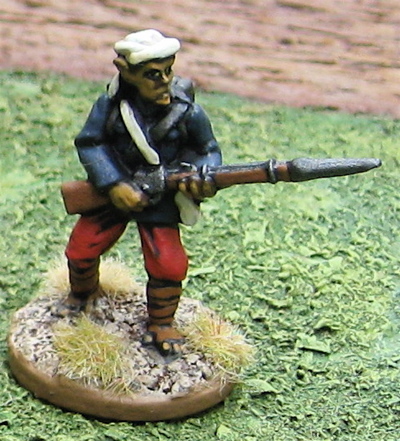 The first of three French Infantry units I have to paint…. 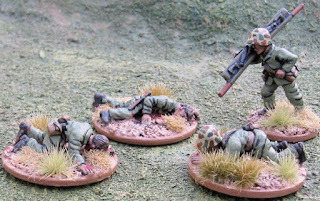 These are from Great War Miniatures. I really like the poses and detail that go into these. Production has slowed somewhat this week and will continue to be slow over the next week. Now that I’ve got these done, it’d be nice to finish up the other two, but I don’t know if my attention span can last that long at the moment. I have been working on some British officers… and still am… but I kind of got distracted by these… and finished them up while watching the last two episodes of Game of Thrones season two last night. With this lot I have officially painted 100 more 28mm foot than I have acquired so far this year! Huzzah! (though I still need to catch up on vehicles and mounted troops…)! No more painting deficits and it’s time to bring down that painting debt! I should really do a big stock taking like the one I did a few years back - just to see where things are at… It will, however, probably prove… embarrassing! 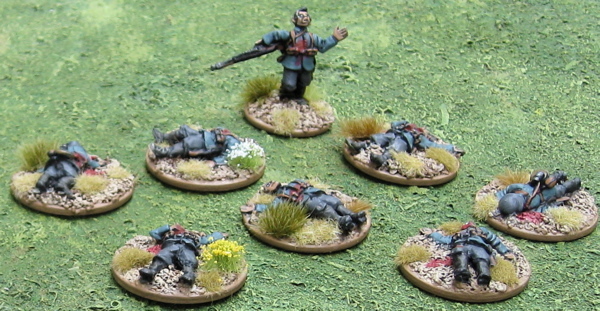 Two Great War French St. Étienne machine-gun teams from Great War Miniatures. Really quite a nice little kit. I also have three French 1914 infantry units from GWM and a unit of Dragoons to fix up and paint. 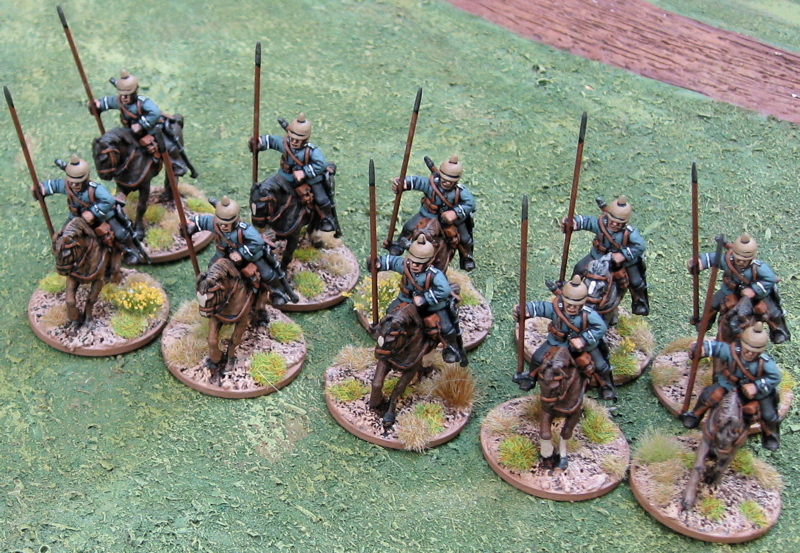 Oh and I have that unit of Chasseurs à Cheval that I painted up last summer. 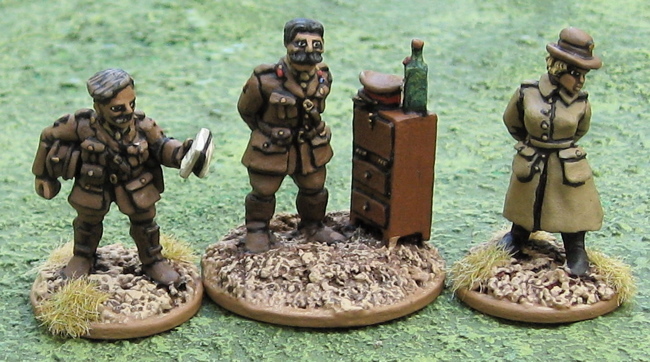 Those British Officers… or maybe a unit of 1914 French… or Martians… or… something else completely different. I’m not sure what possessed me to paint these either. Likely because the were acquired recently (as in this year) and have been floating around the painting areas getting prepped and based and primed and gooped… and looked simple enough and… well… just got painted… Unfortunately, other than the four medics and four casualties I now have, I only have a single squad of leathernecks painted… a Regular rifle squad, and two more squads of Marine Corps raiders. These jarheads are from The Assault Group. Some of the assault group stuff leaves something to be desired, but their WW2 marines are first class! Um… Some Great War British Officers…? The British officer is from Black Tree Design and the Martian infantry are from RAFM. 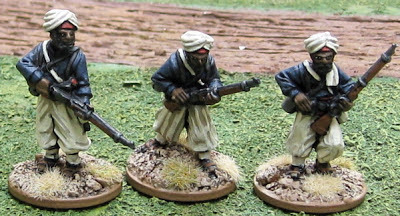 I picked up enough martian colonial infantry for four such units. One I’ve already painted as the 2nd Battalion Queen’s Own Martian Rifles (the Parhoon Rifles). Originally I thought I’d do two in Khaki (as this one above) that would ostensibly be British, but could be passed off as Martians in the service of just about any colonial power. 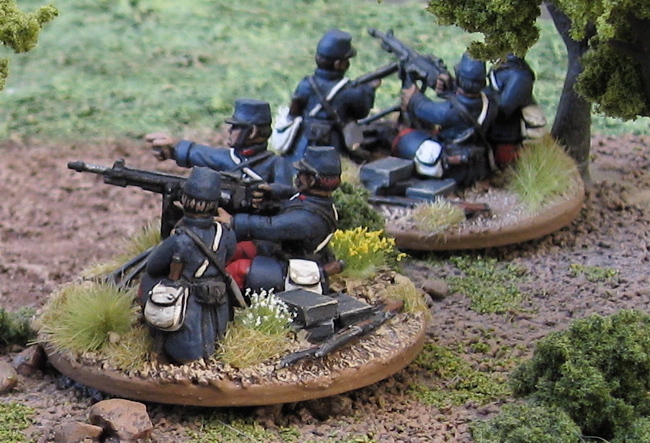 The fourth I’ve been planning to do in light blue tops and dark blue bottoms to pass as Belgian Martian troops. Rather than doing a second unit in Khaki, however, I’ve decided to do a unit in dark blue tops and red bottoms and call them “Tirailleurs Martien” in French service. I also have some High Martians - at least one sizable unit painted and another to be painted. I figured I could use them as per light cavalry that can pass through (over) any other troops… I also have some Colonial Martian Artillery and native Martian Artillery for support. What I really need to get doing is Martian native troops - Oenotirians and such - as an opposing force. Though I suppose I could pit any European colonial force against any other… with some Maritan colonial infantry fighting along side. And what is with all the Great War Fantasy figures all of a sudden!? Hasslefree Miniatures is making English Halflings and Tsarist Dwarves and Black Hat Miniatures is making German Goblins and FRENCH Halflings!? Did I miss the memo stating that this is now “a thing”? Is there a specific set of Weird War One rules out there that people are using them for? Are there MORE of them out there!? This is one of those things that I just can’t decide if it’s awesome or just daft. It’s a fine line. A casualty from the same line. There are a number of odd and sundry things polluting the temporary workbench… Martian colonial troops… zombies… Great War French…. Masai warriors… Elves… Whatever shall I do next!? Charles de Gaulle from Black Tree Design. I have no idea…. When am I ever going to use a Charles de Gaulle figure!? I guess I do have some WW2 French… both Early war continental and Legionnaires for North Africa… I suppose he could wander onto the table to boost morale of the troops. 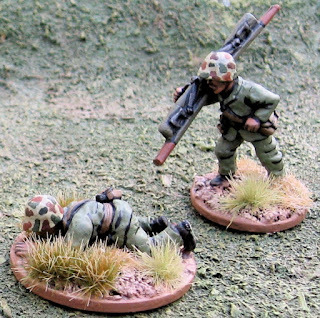 Or be a target of assassination by some crack SS Kommandos in a pulpy WW2 game…? Two British (or Canadian) Great War casualties from Old Glory. I have some Great War German Jägers coming up in a separate post right after this…. German Casualties, Tirailleurs, and... a Cultist!? A few odd items I finished up yesterday. Another indoor rainy day capped off with watching two more episodes of Game of Thrones. We’re now halfway through the season. German Great War Casualties from Old Glory. Tirailleurs Algérien from Artizan Designs. I got these three as part of the French Foreign Legion Lucky Bags. Just need to pick up a couple more packs to make a unit… for now…? I guess I could use them as guides attached to the Legionnaire units? Tirailleurs Martien!? This is a Martian Colonial Trooper from RAFM that I’ve painted in French colours to pass off as French Indigenous Colonial Troops on Mars. On close inspection the equipment – particularly the back pack and water bottle (and rifle) have a distinctly “English” look… but I’m hoping when an entire unit is fielded no one will notice. An odd cultist I found that I hadn’t painted when I went to re-base his brethren. The figure is one I modeled and cast myself. I’m working on some Great War German Jägers at the moment. 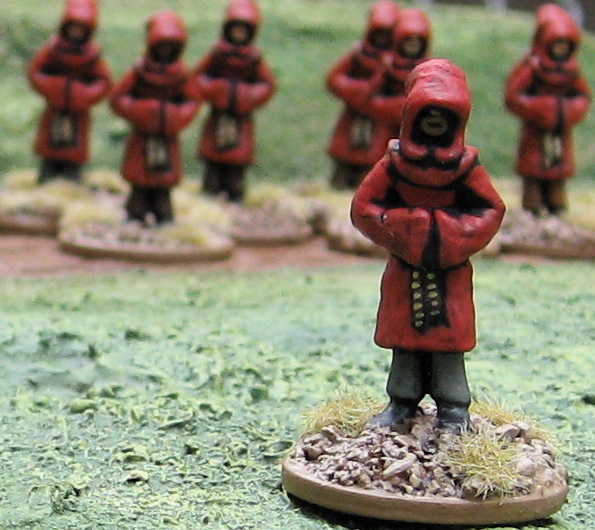 More Martian Colonial troops have marched on to the painting table. I should really get painting some native Martian hordes if I’m going to do these Martian Colonial Troops…. The second season of Game of Thrones arrived for me at the local library yesterday. So Amanda and I sat up way too late watching a few episodes - we have one week to watch it all as I doubt I'll be able to get it back again for some time! I managed to get these (and a couple mounted figures) finished up while watching (or, rather, listening and occasionally looking up to see what's going on...). Should have a fairly productive week with 7 more hours of TV viewing ahead of me! The last unit of Legionnaires from More Legionnaires from Artizan Designs. All but two are from the March or Die line. The other two are from the pulp adventure line that I modifield to have covered kepis. 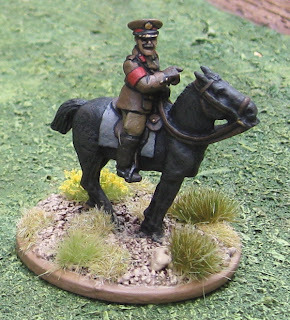 British or Canadian General on Horseback. 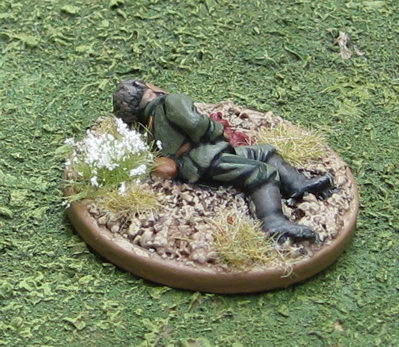 The figure is from Great War Miniatures (I think). The last of the Légion Étrangère (for now…). I’ve been painting the last batch of Legionnaires these last few days – along with some other stuff. These four, because they’re a bit different than the rest, ended up getting finished up a bit earlier. More Legionnaires from Artizan Designs. The last unit of Legionnaires… some odd cavalrymen… other stuff. 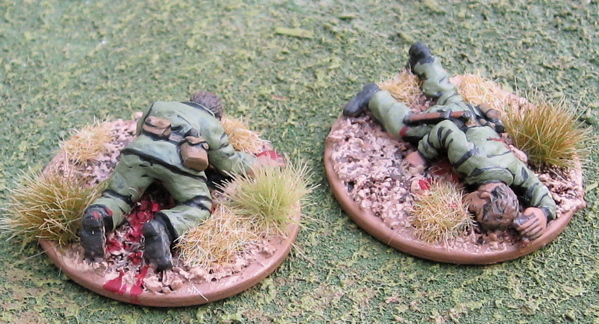 I started on the last of the French Foreign Legionnaires the other night and happened to finish up these last night. 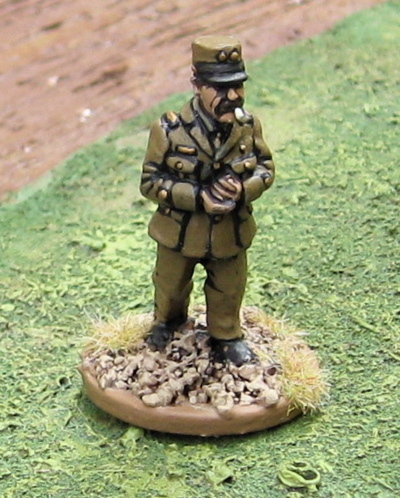 As mentioned the last of the French Foreign Legion (that I have) will be next up. 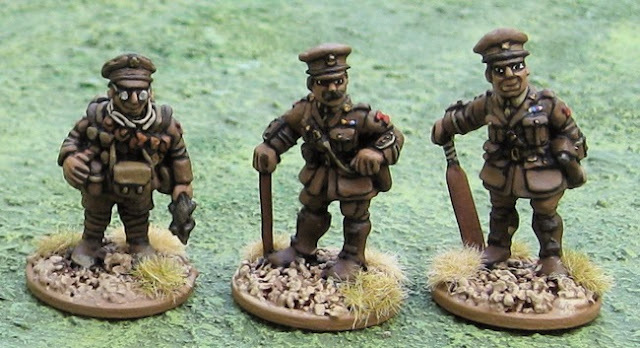 Then I have some Great War German infantry lined up to go next – along with some WW2 Canadians and some… er… ELVES!? 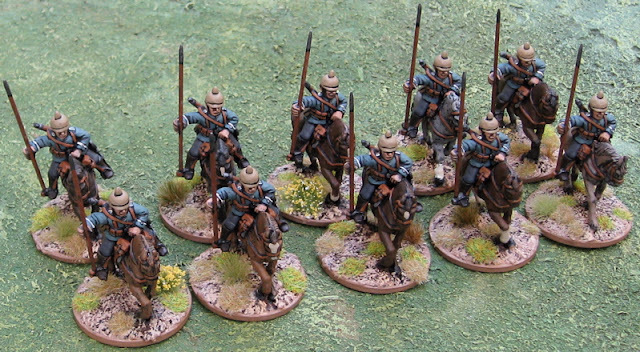 A few more of the Great War Cavalry from Will. These Dragoons are all from Wargames Foundry. They will go nicely with my German Hussars. 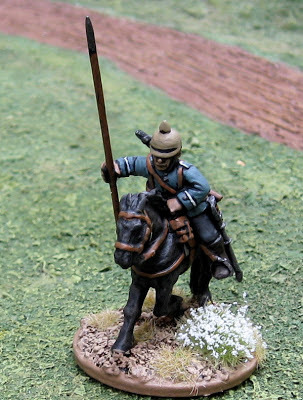 With the French Chasseurs and the British and Indian lancers, things are brewing up for some serious Great War cavalry battles! 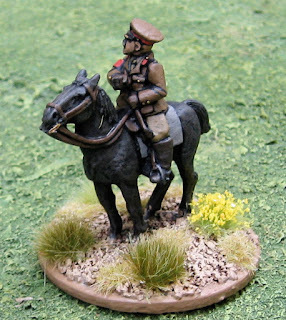 I do have a few more units of Great War Cavalry – some more Australian Light Horse and two more units of later war Canadian Cavalry… Stratcona’s Horse? Fort Gary Horse? Royal Canadian Dragoons? Not sure which… I’ve already done the Canadian Light Horse (with Old Glory minis – the ones I have to paint are all Great War Miniatures). 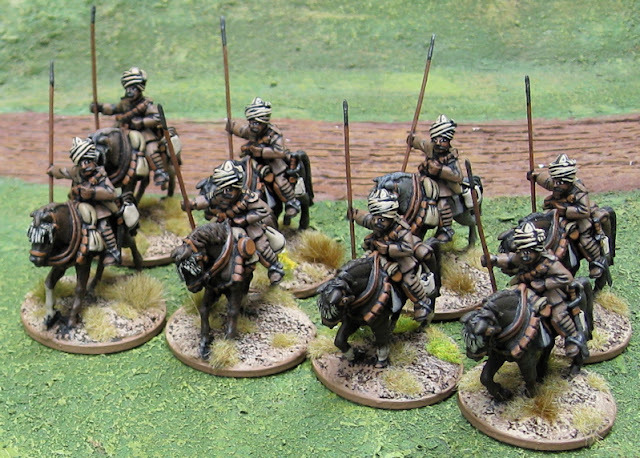 These are Indian Lancers from Brigade Games. The minis, I think, are part of their Great War in Palestine figures, but I’ve painted them in Khaki Serge in hopes of being able to pass them off as some contingent to the Western Front (or possibly Imperial troops brought to England to defend the Crown in a Very Brtitish Civil War scenario?). These minis were passed on to me by my friend Will Bailie who was doing a bit of a clean out before one move or another… (Thanks Will!). I hope someday we’ll be able to throw them down on the table together. On another note, I've been trying to update the pages lately - mostly adding pictures from elsewhere in the blog... check them out over in the left. I’ve often had two painting stations set up in the house. One a semi-permanent location upstairs on a card table in the loft where the TV is at – I often sit up there and paint while Amanda and/or the kids are watching a movie – or if everyone’s out, I’ve been know to put on a movie and paint, listening and looking up once in a while to see what’s going on. The other is on the Big Hobby Table in the War Room/Hobby Dungeon in the basement. It’s actually less permanent than the one upstairs (even though the one upstairs COULD be taken down at any time, if the space were needed) as I have to clear it away whenever we play a game. As previously mentioned, we’re having some major renovations done to the upstairs which has required me to dismantle the upstairs painting station and move a whole bunch of the other stuff from the top floor into the basement War Room/Hobby Dungeon for storage which has pretty much shut down any activity there – gaming or painting…. I have, however since moved a temporary painting station back upstairs as we’ve found out the contractors won’t be able to start until the end of the month – at the earliest… which is a bit of a drag. When we’d talked to them last fall it sounded like they wanted to get going as soon as the snow melted and dried up… Anyway, the new temporary painting station is as cluttered as ever already… Legionnaires, German Dragoons, the last few zombies… all sorts of stuff up there ready for paint. What I will do next? I have no idea. This is what happens when I don’t play games for a month… I get distracted. Not that being distracted is bad, per se. Perhaps this was a bid to get John back at the game table…? 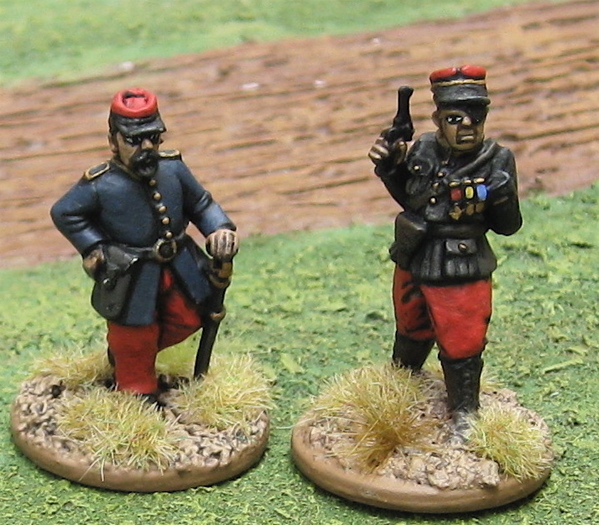 1914 Belgian Carabiniers from Great War Miniatures. Lovely figures. I have 18 of them. I’d like to pick up another 12 (at some point!) to fill out two units of 15. I’m thinking I might pick up some of the Carabiniers from Brigade Models - just for a bit of variety. I’m not sure what to do for an officer for this unit (or THESE units, when there are two!). No one seems to make a specific “Carabinier Officer”. Brigade has a Carabinier NCO, and GWM has a Belgian command pack that has an assortment of uniforms and headgear – none in the Tyrolean hat the carabiniers seem to wear. Did the Officers wear the Tyrolean hat? I have an officer in a sidecap – could I pass him off as a Carabinier officer? He’s not in a great coat, however… and I’m not even sure if their tunic colour would be the same colour as the carabiniers great coat…?! More French Foreign Legionnaires from Artizan Designs. This finishes off the guys I have with sun helmets. I have another unit of guys in kepis. The bulk of this force was put together from a couple of North Star Lucky Bags. The lucky bags are an assortment of random figures at a fairly deep discount, but they are often from pretty wide collections – like WW2 British, which could include british from either Artizan designs or Crusader Minis and could be early war or late war European or commandos or 8th army in North Africa or paratroopers or LRDG or… you get the idea… sometimes is just “ancients” which could be a mix of just about anything… So for the most part they are of little use to me – great for anyone just getting into something looking for a small number of figures for skirmishing…? Ah well, I can’t buy any more of these for some time anyway. I have much, much more that I need to paint before I can buy any more figures. On that note I have caught up and have now painted more minis than I’ve purchased (well… at least in the 28mm foot category… I have to paint a few more mounted!) this year and have no intention of buying any more until I can double than number… time to bring the painting debt down! I’ll probably knock off that last unit of them next… because that’s how I roll – finishing stuff off because it’s fun to finish things… not because I have any practical use for it!? 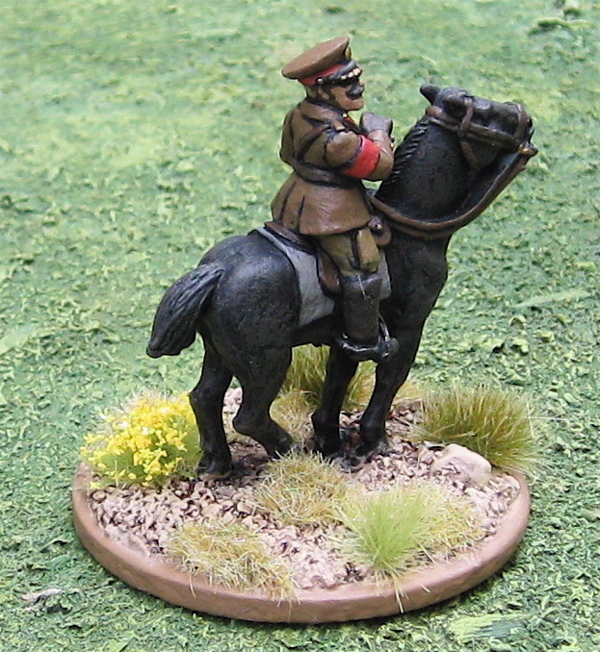 After that I should paint something mounted – to catch up a bit in that category… Maybe some Great War French cavalry…? Or some more of the ANZACs?